Panel Built had a presence at the MHEDA Southeastern Regional Open House on October 12. 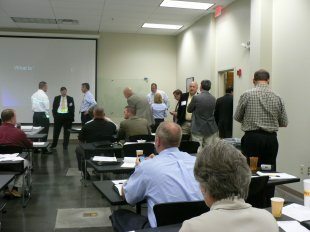 This “Lunch & Learn” event took place at LiftOne in Charlotte, NC, and while most attendees were regional, some represented companies as far away as Illinois, New Jersey, California, Oregon, and Ontario. The crowd was a mixture of suppliers and distributors, and all were there to take advantage of the excellent presentations and the opportunity to network with their peers. 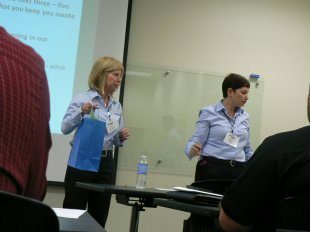 Although the room was thick with competitors, the atmosphere was congenial and everyone was ready to learn. After introductory statements from LiftOne President Bill Ryan and MHEDA Executive V.P. 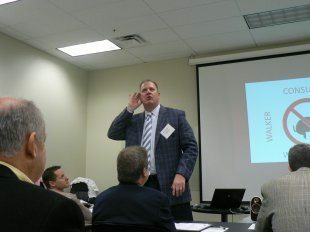 Liz Richards, there was an amusing and thought provoking presentation called “Raising the Bar of the Sales Professional in the Material Handling Industry.” The speaker was William Walker of the Walker Consulting Group. William had an interesting way of approaching basic sales truths, injecting them with insight, and adapting them for the modern world. He stressed the necessity, in an online society, of a salesperson bringing something new, relevant and impactful to the customer…something they can’t find on the Internet. According to William, material handling salespeople need to change their mindset from selling a product, to selling increased productivity and a positive, measurable impact on their customer’s bottom line. After the speakers there was a catered lunch, and then the hosts at LiftOne gave a tour, showing off an impressive facility and considerable inventory, including a prototype hydrogen powered forklift. The Lunch & Learn wrapped up with a round table discussion of “what about your business keeps you up at night?” There were many business owners and upper level managers in the room, and the overwhelming consensus seemed to be uncertainty about healthcare costs. There was a drawing for various prizes, with the grand prize of a free entry to the 2012 MHEDA Convention, which will be held in Miami May 5 – 9. Panel Built is pleased to be a Supplier member of MHEDA, and looks forward to the benefits this association will bring to our company and our customers.